Let Scotland go and compete. Everyone would win. 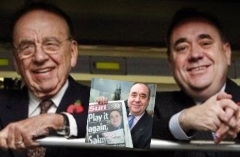 Given that his father’s family moved from Scotland to Australia this could just be sentimentality, however if Murdoch did decide to back Salmond in the referendum, it could all get very interesting. The Scottish Sun swung behind the SNP at the last Scottish elections, just four years after saying a vote for them would be putting Scotland’s head in a noose.